Rent villas and apartments in Alameda del Mar, Spain with swimming pools. Book affordable holiday rentals that are near a beach and golf course. (Licence VT-469791-A) This beautiful fully air-conditioned 3 bedroom ground floor apartment is bright, modern, comfortably furnished & well equipped throughout. Ideal for holidays all year round. 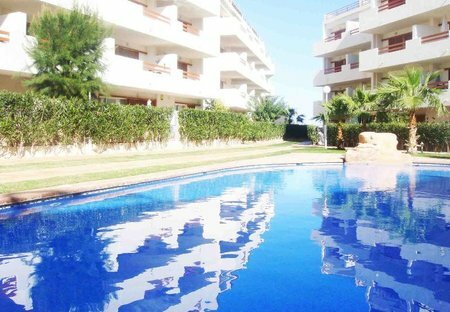 This 2 bedroom apartment with swimming pool is located in Alameda del Mar and sleeps 4 people. It has WiFi, air conditioning and parking nearby. The apartment is within walking distance of a beach. Modern, well equipped and tasteful apartment with terrace, where you can enjoy a glass of wine and the view of the communal area with pool and gardens. The beach. This lovely holiday apartment is located on the 1st floor of a building with lift and ramp. The apartment offers 2 bedrooms and 1 bathroom on a floor space of 65 m². This apartment on the ground floor with a terrace is located in the popular urban area of El Horizonte. It has all amenities within walking distance. Attractive, spacious, well-appointed, ground floor apartment on select complex, close to all amenities. Large main pool with 3 smaller pools. Ideal for families or couples.